Over the last few days, a lot of updates have been made in Bitrix24. We’d like to mention again that you can test all the functions of the Professional plan, free, for 30 days. 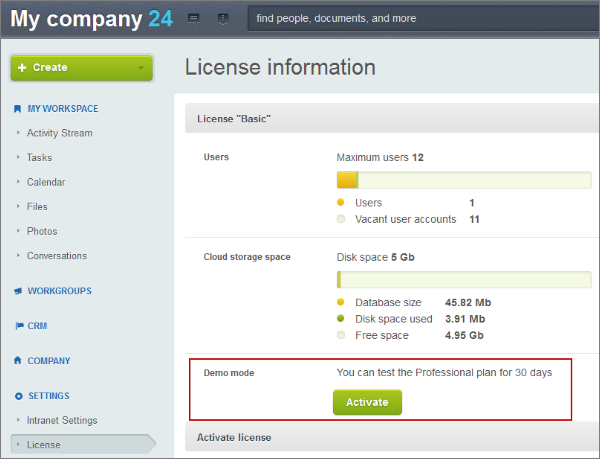 All you need to do is activate the demo mode in your portal in the Settings ->License section. After 30 days, you will be returned to your free plan, or you can pay to continue with any of the paid plans. And now to the new stuff. 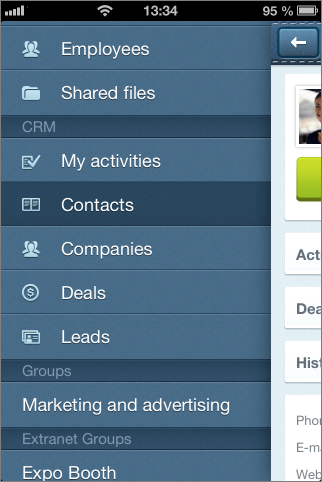 Now you can access your CRM not only via a browser, but also from your mobile device. 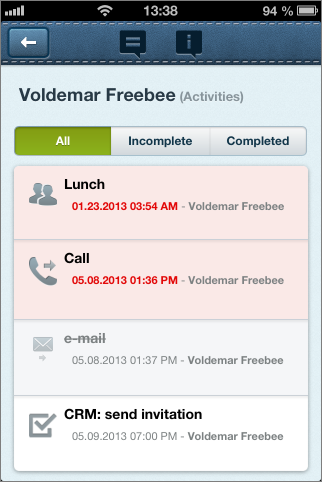 You can view activities, contacts, companies, leads, make calls, and send messages directly from your mobile. Click on a contact and the detail page will open. Here you can see all the contact’s (or lead’s) data and make calls or send messages. The activity list for this contact and use pre-set filters to view completed and incomplete activities. The activity list lets you make a quick plan for your working day no matter wh ere you are. Overdue items are highlighted in red. You can view the complete activity list and open individual activities from it. If you do not have the mobile app installed on your device yet, download it right away from the App Store or Google Play. 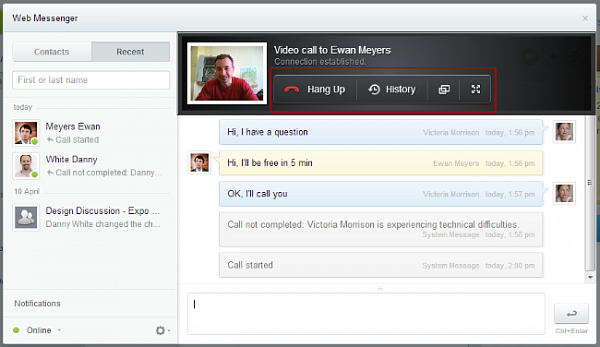 No less important are the audio and video capabilities now in the web messenger. This is completely new technology, which lest you make video calls without installing any additional software – straight from your browser. Presently, video calls are available for Chrome 26; and will be available in FireFox when version 22 (now in beta) comes out. Simply click on the corresponding buttons in the messenger window and the connection will be completed automatically. When the very first call is made, confirmation of the connection is required. During a video call, you can put the video window on full screen mode or continue to use the chat box by hiding the video window. History is also available in this view. All call history is displayed in chat. If a call is not completed, the system will report that the other user is not online or that his/her browser does not support calls. 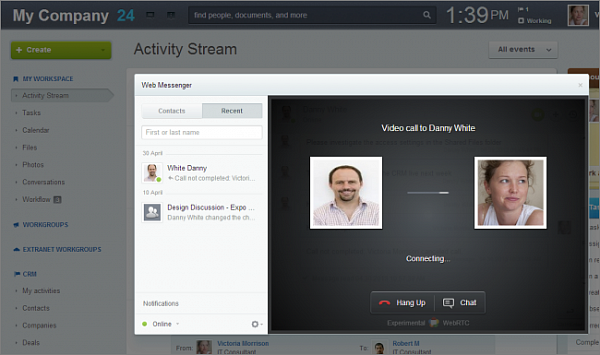 Video calls in Bitrix24 use WebRTC. This technology allows video connections via a browser without plugins or other additions. The only requirement is that the browser used must support the technology. Confirmation of messages having been read by the recipient. Important announcements in the Activity Stream can now be shown in the Announcements box. By choosing ‘Announcement’ as the type of message, the message will show up in a separate box. You can still choose recipients, attach files, include mentions, etc. 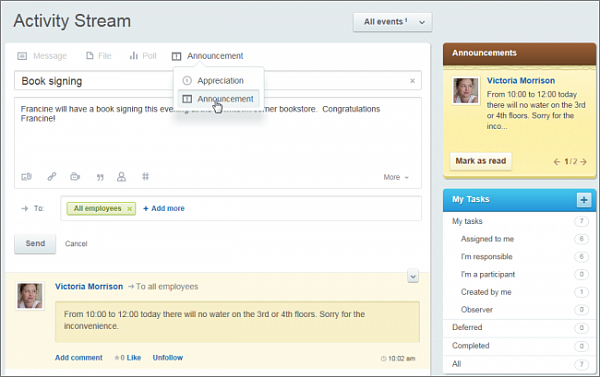 After saving, the message will be available in the Activity Stream and color-highlighted. Additionally, it will appear in the new Announcements box for any recipients and remain there until the user has marked that the announcement has been read. 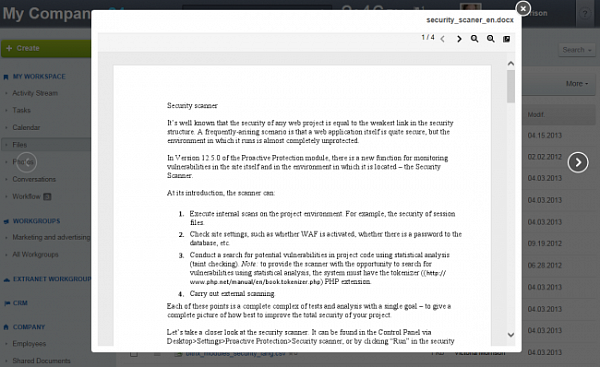 Now you can view documents in the portal using Google Docs. That means that you do not have to use a locally-installed application (like Microsoft Word or Excel) to see file content. Support for Google Docs lets you open and preview documents of popular formats directly from the portal. You can preview multi-page documents using the arrow on each side of the preview display; you can also change the visual scale of the preview. 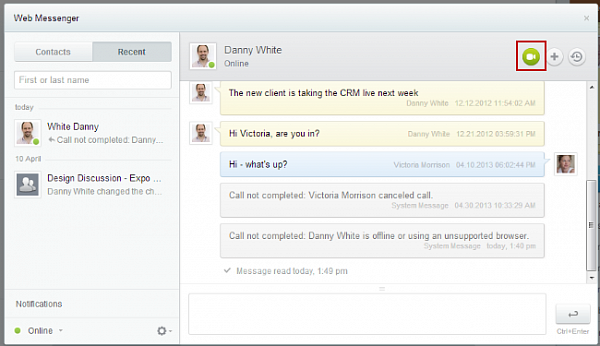 Documents can be previewed not only from document libraries, but also from messages in the Activity Stream. Currently, this function is only a preview mechanism, but we plan to add editing as well. The following settings can be configured for this feature: activate or deactivate preview via Google Viewer or Google Drive. 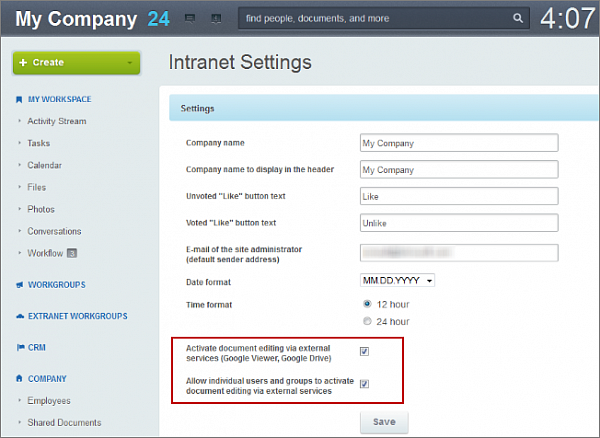 Settings are available on the Settings –> Intranet Settings page. 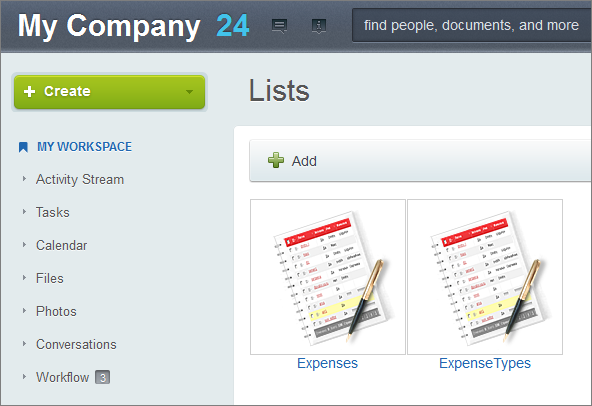 Bitrix24’s cloud version now has lists. This is available only in the Professional and (new) Enterprise plans. This feature is a universal tool to hold and display structured information. So it could be used for glossaries, structured storages, partner lists, expenses, etc. This section is available in the left-hand menu under Company –> Lists. Only administrators can create new lists, but each list can have its own access permissions. To start working with lists, an administrator must create a new list and set access permissions to it. Only then can the list be made available to all users. When creating these lists, you can chose the name of the list, upload an image or logo for the list, set access, and make Business Processes available in the list, among other things. Individual fields in a list can hold all manner of data – text, numbers, dates and even files. Bitrix24 now has a new tariff plan called Enterprise, which includes a number of additional functions: AD/LDAP, lim itation of access by IP address, enhanced support, and much more. Details can be found on the Bitrix24.com site. Aside from all of the new items, there have been several changes in existing functionality, improvements, and corrections of errors which will make work in Bitrix24 faster and easier.